"Outside of a book, a dog is a man's best friend; and inside a dog, it's too dark to read." Attributed to Groucho Marx, Dr. Joyce Thomas said this quote best captures her interests and personality. 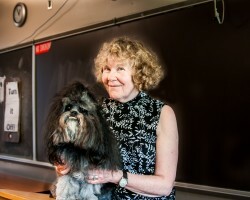 A native of Annapolis, Maryland, she teaches a virtual cornucopia of courses, including Lyric Poetry, Folk Tales, Art of Children's Book Illustration, Greek Tragedy, Epic Poetry, Native Literature, and Shakespeare's Tragedies. Wherever possible, her approach to teaching seeks to combine the critical and the creative. “One assignment in Lyric Poetry, for example, asks students to treat the same subject by writing three different types of poetry, followed by an essay in which they discuss how the subject changes as the form for its expression changes,” said Thomas. Additionally, a paper in Folk Tales asks students to translate part of an experience they've had into a story incorporating the folk tale's traditional elements. The students then discuss the connections they perceive between their own lives and tales and draw parallels between reality and fantasy. “In Art of Children's Book Illustration students' final papers are to be artistically designed in keeping with the aesthetics of the children's books they've discussed in class,” she said. Among the most published of faculty at Castleton, Thomas has written a study of the fairy tale, Inside the Wolf's Belly, and a collection of poetry, Skins, not to mention various articles. Her poems have appeared in both anthologies and journals such as Blueline, American Review, and JAMA: Journal of the American Medical Association. Her passion for words is evidenced not only in her poetry but it also surfaces in her teaching, and in her interest in fiction. Currently, she is putting together a second collection of poetry while also trying her hand at writing short stories.